When your mind's eye takes you to the Arctic, you probably imagine polar bears, not a tiny animal resembling a gerbil. However, some lemmings do live within the Arctic Circle. Both lemmings and voles are found in such bio-diverse regions as the snowy mountains of Alaska and the bogs of Minnesota. Lemmings are found in Alaska, in and around the Arctic Circle to Siberia and in parts of North America. They are tiny animals, only about 3 to 5 inches long, resembling a gerbil with a very short tail. Their ears are hidden, giving their heads a round appearance similar to that of a teddy bear. There are 30 known species of these tiny herbivores. Their coats are dense and quite effective for keeping them warm during the harsh Arctic or Minnesota winters. There is a widespread distribution of lemmings across much of North America, and some species of lemmings are so rare they've been listed as a species of special concern since 1984. The northern bog lemming, southern bog lemming and brown lemming of Alaska are the only lemmings living in the U.S. Another species of lemming, called the collared lemming, is the subject of debate among scientists who cannot agree if it's a true lemming. Voles and lemmings are so closely related that it's hard to tell them apart. It usually takes an expert such as a wildlife officer or biologist to see their differences. 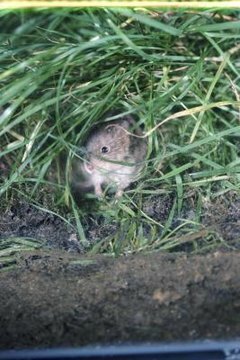 There are 23 species of voles, but only 11 are found in the U.S.: prairie, meadow, long-tailed, red-backed, montane, woodland, California, rock, heather and Oregon voles. Their distribution is widespread across North America and their populations peak in cycles, generally every three to five years. Lemmings and voles are viewed as both useful and destructive. They provide food for birds of prey and other carnivores. They assist in aerating the soil, which is helpful to gardeners. However, both lemmings and voles are considered destructive animals and in most states they are under no protection. The exception is in Minnesota, where the population of the prairie vole is closely monitored. Unlike rats, they're not considered a public health threat, but they are capable of carrying certain diseases such as the plague and tularemia, a bacterial disease. A Disney documentary, "White Wilderness," perpetuated the myth that lemmings have some kind of suicide pact and willingly throw themselves into the ocean to make room for the next generation of lemmings. However, filmmakers faked the footage and solidified the myth in the public's imagination. The truth is, lemmings don't commit mass suicide by throwing themselves off a cliff. Lemmings, like so many other animals, struggle to survive in a world where their native habitat is mostly gone.